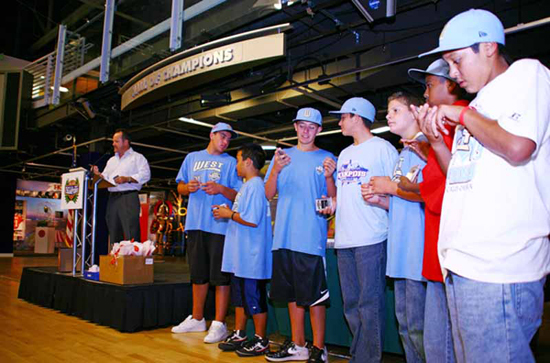 The past Friday evening, the 2009 Little League World Series Champion “Park View All-Stars” from Chula Vista, California, were hosted to an autograph signing session/pizza party at the San Diego Hall of Champions Sports Museum in Balboa Park. The event, orchestrated by Park View All-Stars League President Rod Roberto and the Hall of Champions, was a way for the team to get together after their momentous season to collectively sign a variety of items (photos, caps, baseballs, bats, etc.) for family members and friends who helped support them through their journey to baseball history, which culminated with a championship game victory in Williamsport, Pennsylvania, on August 30. Since their 6-3 win over Taiwan in the title game, the team’s 12 players and two coaches have been riding a crest of goodwill from local businesses and organizations including the San Diego Padres, San Diego Chargers and the Upper Deck Company. As the first team in 48 years from San Diego County to win the whole ball of wax, the Park View All-Stars certainly earned their newfound celebrity status. And as a way to commemorate the team’s achievement, Upper Deck printed 250 cards of each of the players and coaches that they could share with family and friends. As Upper Deck’s public relations manager, I was on hand Friday to present each of the Blue Bombers with their red-hot cards. DISPLAY CITY: Upper Deck set the cards up nicely for Friday night’s handoff. 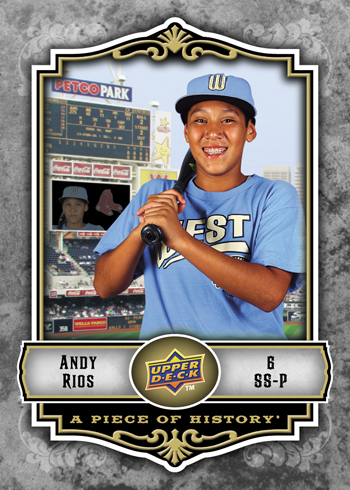 MVP: Park View All-Star Shortstop Andy Rios was named the LLWS MVP. 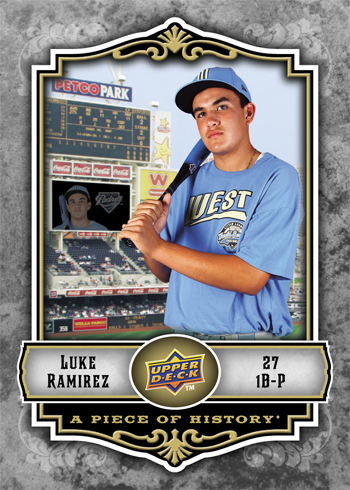 BIG BAT: Park View All-Star First Baseman Luke Ramirez strikes a pose. RECEIVING LINE: The Park View All-Stars line up to receive their prized keepsakes. 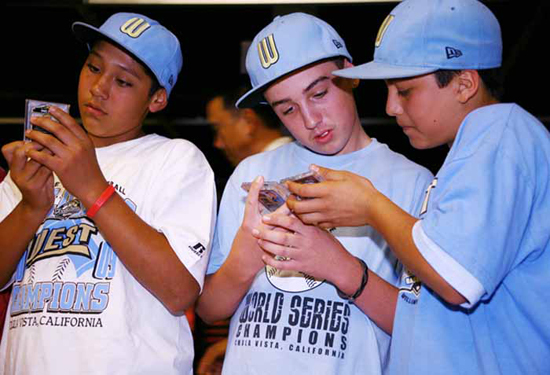 CHECK THIS OUT: Teammates Andy Rios, Seth Godfrey and Daniel Borras Jr. admire each other’s cards. TEAM PHOTO: The Park View All-Stars show off their Upper Deck cards with UD PR Manager Terry Melia in tow. 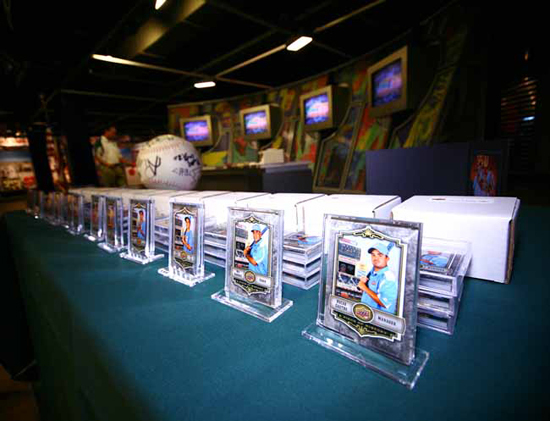 Sports Cards on the Decline? Guess Again. Chula Vista’s Little League World Series Champion Park View All-Stars Visit Upper Deck!